Alexandre D ' Angeli WASTE performance. Photo: LCzepaniki. Alexander D WASTE performance ’ Angeli. Photo: LCzepaniki. Action that opened the sector of SP-Art performances 2016, the performance WASTE will be presented at Sesc Bom Retiro inside shows PER-formed in day 13 September, Tuesday, from 19 to 21 hours. 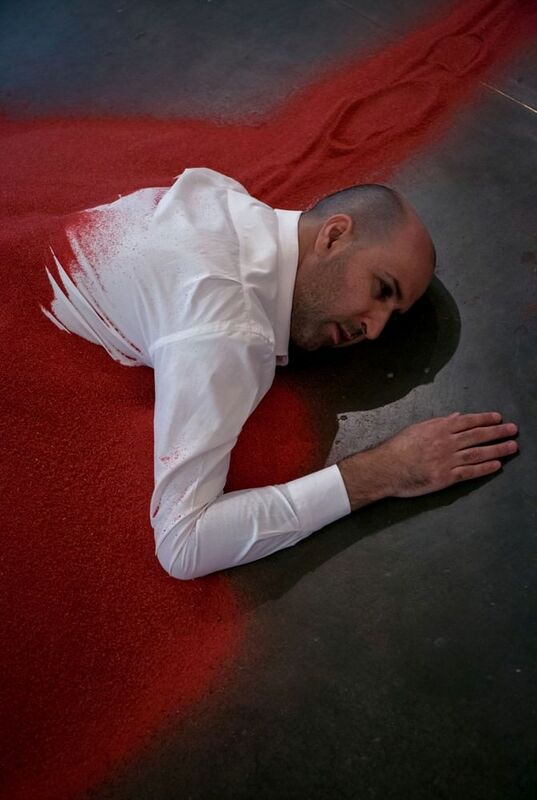 The work of the artist Alexandre D'angeli, I have also happened in 2015 in the city of Porto, in Portugal and in 2016 the international Manifestation MIP3 – III Performance, in Belo Horizonte. In a century already marked by confrontation and widespread distrust, credulity in affection and its multiple forms of existence becomes a bet. The Shows PER-FORM, which happens to 3 to 29 September in the Sesc Bom Retiro, brings together a series of presentations of performances causing reflection of aesthetic experience, pushing the boundaries of culture and identity. WASTE continues the research of the artist Alexandre D'angeli about possible interactions between body and space and its traces|memories in search for sensitive approaches with architecture and its equipment. 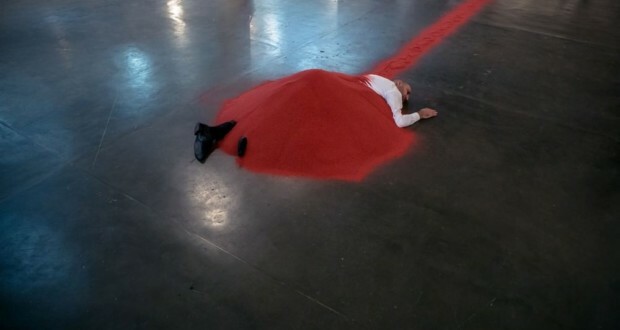 In the work, He proposes think intangible residues of human action results in large cities, leftovers of your projects, investments and affections, the artist is under 350 pounds of red sand. For Alexandre D'angeli, WASTE dialogue with the physical elements, aesthetic and symbolic of the places where it happens and incorporates the participation of the subjects who inhabit and transiting through the city, In addition to creating new landscapes. The work also joined, in Gallery, the programming of the Performance in Meeting in Sesc Campinas, event that marked two years of the project Performance developed by the unit. From the architectural elements that configure the environment, the program proposes that the performer seeks various surfaces, such as ramps, departures, failures, corners, support or borders, they can serve as support to accommodate themselves and initiate performance. 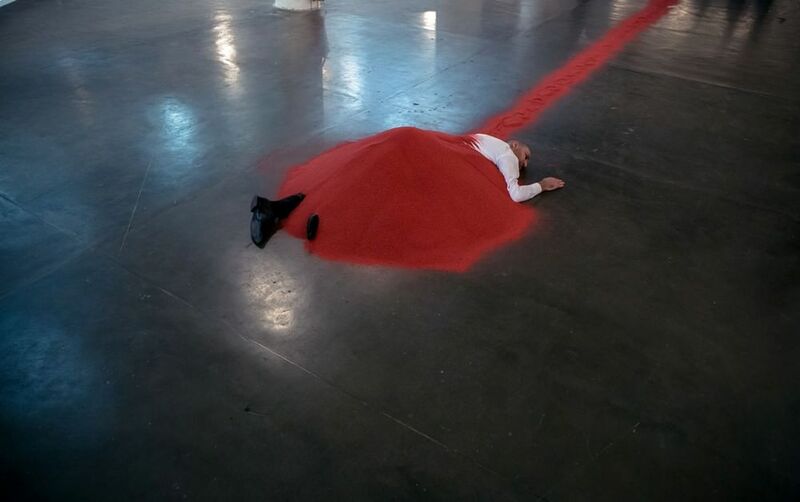 Making use of 350 pounds of sand-colored red is defined a path approximately 10 linear meters, where one end DEMARCATES through sand the start point of the action and to the place where the artist will accommodate. About him is deposited all the remaining sand and, and, He will remain immobile for a period of 1 hour. In the next 60 minutes all the material is moved only with use of the body to the point of origin, with only traces-action memory. WASTE proposed approach and understanding audience artist of the process of subjectivation, of which the body is both a producer and agent product. A body deposited under a mound of sand, symbol chosen to represent our daily attempts. "Everything you expect and that still lies buried, like a seed of something precious, ready to germinate, but that is deposited under a mound of sand, infertile, It is produced by our daily attempts ", explains D'angeli. Performer, actor and puppeteer with a degree in performing arts. Specialized in Dramatic corporeal MIME and Theatrical Stunt by Ecole International de Mime Corporel Dramatique Gestuel of Paris. Interested especially for body-related languages, and that operate at the intersection of performance and the theatre. Joined recently the second edition of the Mezzanine Gallery MOVES with the performance The Reader, In addition to participating in the V Bienal de Bogotá and Performance Festival La Plaformance-networked Resistance. Participated in the SP-ARTE 2016 with the performance Waste, work in 2015 was held at the bad habits of Artistic Intervention Space, in the city of Porto, in Portugal and also of Performance in Meeting the Sesc Campinas. Participated in the exhibition Communal Land – Marina Abramovic + MAI as a facilitator of the Abramovic method. In the same year 436, long-term performance and installation, proposing to visitors of the Memorial of the resistance of São Paulo Assembly of 436 paper faces in memory to the dead and missing politicians. With Listening to the Sheep Sleeping, performance with texts of the author and cartoonist Caco Gallardo, joined the occupation project It's Right There, the Sesc Ipiranga. The action also performed in the Winter of Sesc Rio de Janeiro and Virada Cultural in Belo Horizonte at Sesc Palladium. In 2010 was responsible for the artistic interventions carried out in the Tietê Bus Terminal during the Virada Cultural, emphasis on Valuables and Présence Decroux. Participated with the performance Valuables parallel opening 29th São Paulo biennial promoted by Sesc Campinas. Creator and performer in Molloy – The end is the beginning and yet continue, Show sign Theatre solo inspired by the novel by Samuel Beckett, who attended the shows Samuel Beckett – 100 years organized by SESC Santana and joined the VII Shows Cariri of arts through the Revolving Stage of SESC Ceará. In October 2016 performs performance Listening to the Sheep Sleeping the Barcelo Soil – International Festival of Solo Performance, in Spain. PER-FORM -Of 3 to 29 September in the Sesc Bom Retiro. WASTE – Day 13 September, Tuesday, from 19 to 21 hours, in the exhibition space of the Sesc Bom Retiro. Creation and Performance -Alexander D'angeli. FREE. Duration – 120 minutes. FREE. SESC BOM RETIRO -Alameda Nothman, 185 -Bom Retiro – São Paulo. Phone- (31) 3332-3600. www.sescsp.org.br.